It’s mulberry time and we have been picking like crazy. Our neighbor has huge tree Mulberry tree and we have more this year then ever! Charlee, Alicia, Tom and myself headed out this morning and filled up our buckets with fresh juicy TO DIE for mulberry’s and then the girls helped me make this mulberry pie that I have to say I am now addicted to. 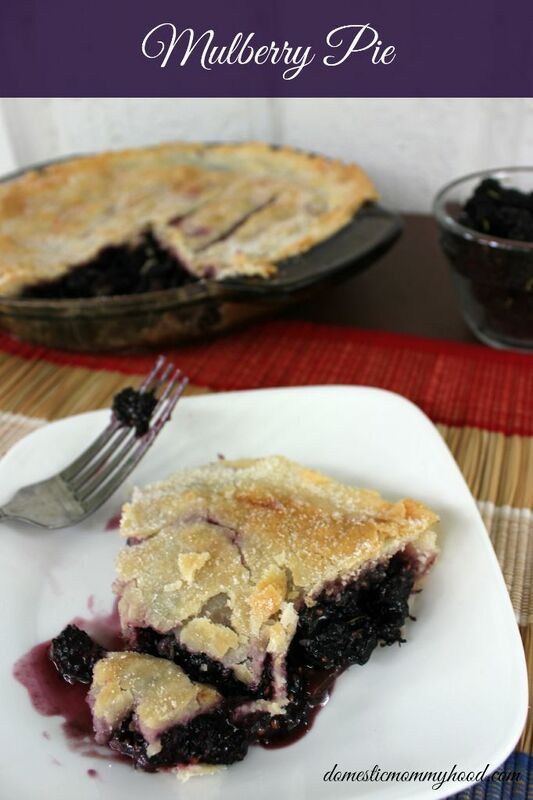 Here are some awesome other pies here at Domestic Mommyhood that you don’t want to miss out on! 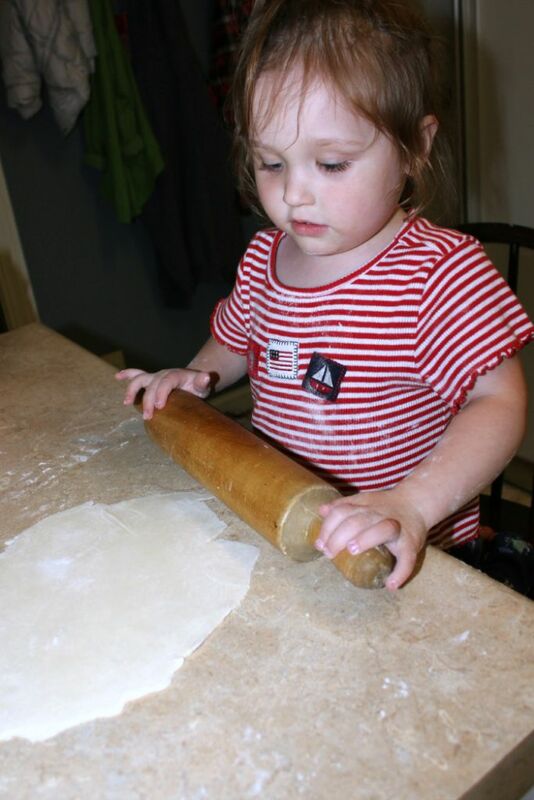 Prepare Grandma Brodie's perfect pie crust recipe and place bottom crust in your 9 in pie pan. In a large mixing bowl mix together 3 cups mulberry's, 1 1/4 cup white sugar, and 1/4 cup flour and mix well. Place mixture into pie crust and spread evenly. Cut butter into small pieces and dot throughout the pie. Center top pie crust over and pie and crimp edges well. Tear off remaining crust from edges. Brush milk over the top of the pie crust. Tear strips of aluminum foil and gently fold over the edges of the pie to cover the outermost inch of the pie to keep the edges from burning. Set pie in refrigerator to rest for 30 minutes. In the meantime pre-heat oven to 440° F.
Bake pie at 400° F for 15 minutes. Drop temperature down to 350° F and bake for an additional 30 minutes. (During the last 15 minutes of baking sprinkle 1 1/2 teaspoon of sugar over pie for a nice touch. Have you ever tried Mulberry Pie before?? Let me know what you think of the recipe. 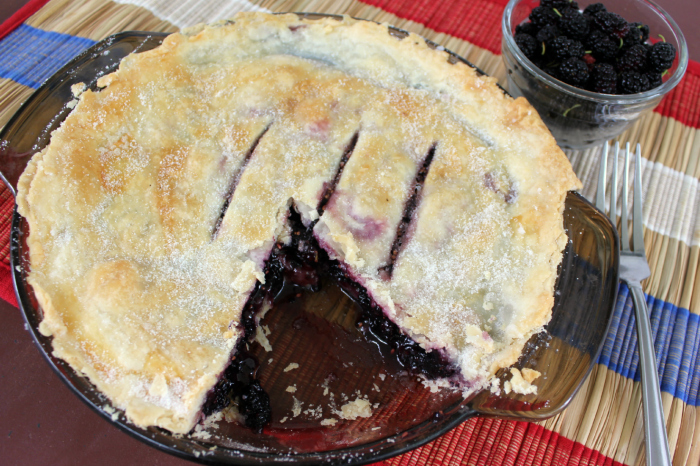 It is so easy to make and is one of the best pies I have ever had and the berries or normally found free if you can find a tree!! You can’t beat that! This is fantastic. Made it for the first time last week (with fresh mulberries from some bushes in our yard) and it was the best pie Ive ever had. Hands down. Quick question, though. When I mix the flour/sugar with the mulberries, I’m often left with sugar that doesn’t get ‘absorbed’ (not sure if that’s the right language) by the mulberries. Is this typical? Just wondering. Thanks for sharing this fabulous recipe!! i have 3 huge mulberry trees in my yard, I never have done anything with them before searched for recipes, found this and just made it… Delicious and simple! The kids devoured it. Thanks for the great easy recipe! I will be making this again! Is it Ok to leave small stems on? Do I have to remove all the mulberry stems in order to make this? Thanks! It is totally up to you. I leave them on there just because it’s easier. Our neighbor has a mulberry tree so I asked if we could pick it this year. Never made a mulberry pie before. I came across this recipe and thought I’d try it. I love to bake but I don’t like to eat fruit pies since I don’t like cooked fruit. And we have five kids so someone always has an issue. This pie was amazing. Everyone loved this pie. I even ate this pie. I will be keeping this recipe thanks!! This pie is out of this world even in South Africa. Loved it, and so easy.